Dimensions 1.25 by 9.50 by 9.25 in. Blending humor, wisdom, history, pop culture, science, and basic cooking knowledge, the host of Food Network's Good Eats presents a special edition of his innovative, instructional cooking guide that features various cooking techniques accompanied by a 'master' recipe for each technique, and provides a vast array of food-related tips and advice. 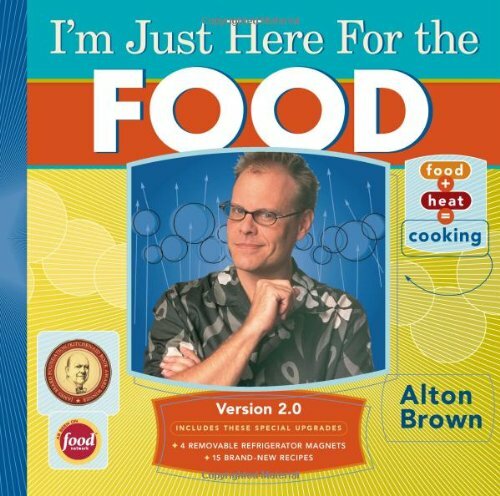 Amazon.com description: Product Description: Eight years ago, Alton Brown set out to create a cooking show for a new generation. The result was "Good Eats", one of Food Network's most popular programmes. Four years ago, when Alton Brown set out to write "I'm Just Here for the Food", he wanted to create a cookbook unlike any other - a cookbook for people who would rather understand their food than follow a recipe. A mix of cutting edge graphics and a fresh take on preparing food, "I'm Just Here for the Food" became one of the best-selling cookbooks of the year - and received the James Beard Foundation/KitchenAid Book Award as best reference book. This year, to commemorate and celebrate this more-than-300-thousand-copies-sold success story, STC is pleased to announce "I'm Just Here for the Food: The Director's Cut". This special edition features 10 brand-new recipes, 20 pages of material not included in the original book, a jacket that folds out into a poster and a removable refrigerator magnet - all wrapped around the material that made the original a classic instruction manual for the kitchen. The book now combines more than 90 recipes with a wealth of information that allow anyone - at any level of expertise - to understand the whys and wherefores of cooking. About: Blending humor, wisdom, history, pop culture, science, and basic cooking knowledge, the author presents an instructional cooking guide that features various cooking techniques accompanied by a 'master' recipe for each technique. With Martha L. Abell, James P. Braselton | Cdr edition from Academic Pr (October 1, 1998); titled "Maple V by Example"
About: Maple V By Example, Second Edition is an excellent reference for beginning and experienced Maple V users.